I decided not to answer any of those questions, but rather just get my first post completed and published before Week 1 had ended. 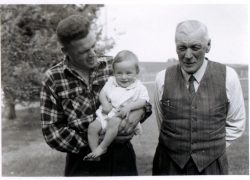 I have been researching genealogy ever since I went to a “Descendants of the first Moffat to emigrate to New Zealand in 1862” family reunion, that was held over Easter 1989, organised by Uncle Peter Moffat. 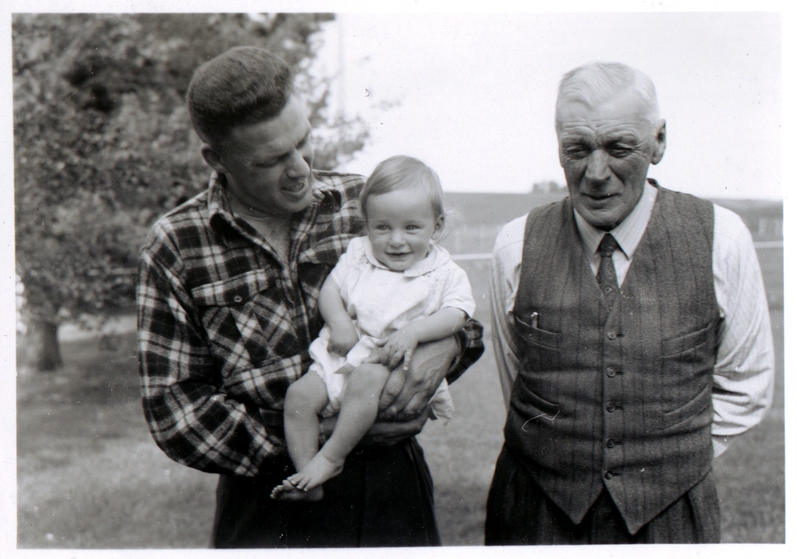 I’ll write about that another time, but in the meantime here are another couple of “firsts” for this “first” post – probably the first pictures of me that I have, with 3 of the 4 first ancestors I ever met. I guess my Mum and Dad were the first ancestors I met, and at least as far as I know, Dad’s parents – Grandma and Grandad were the next. These pictures were perhaps taken at Christmas 1955 when I was 11 months old. 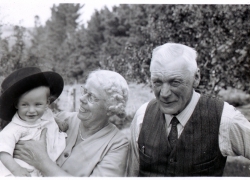 They were definitely taken at the Glenavon farm at Te Houka, Balclutha, Otago, New Zealand – Grandad’s farm where Dad grew up as a boy.